Caption: Projected deaths (in millions) by cause in low-income countries. 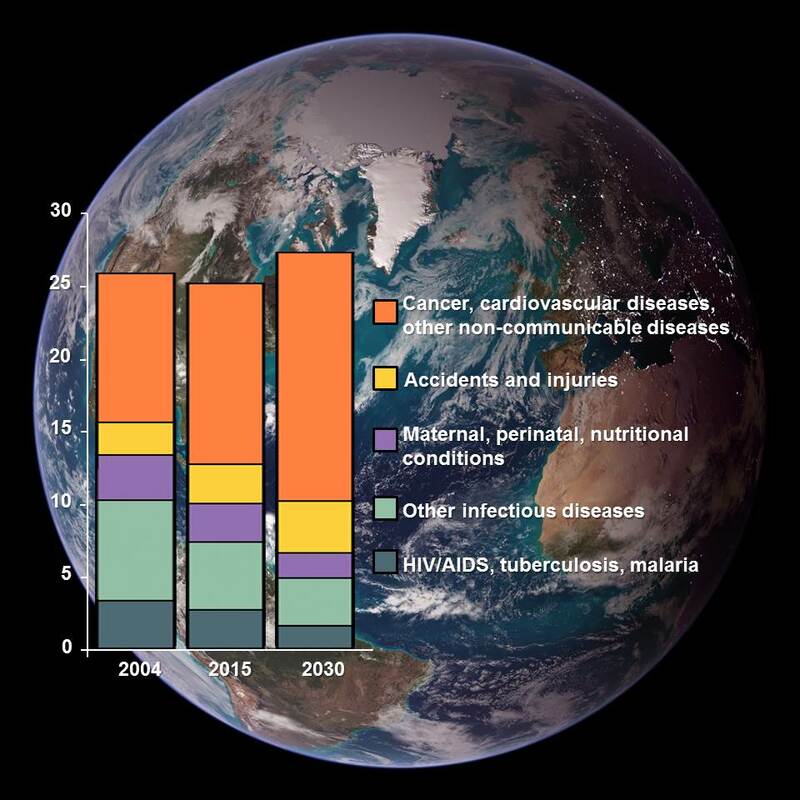 Note increase in non-communicable diseases (orange). Credit: Adapted from Beaglehole R, Bonita R. Lancet. 2008 Dec 6;372(9654):1988-96. Greetings from China. I’m here in Shanghai with other biomedical research leaders for two major meetings. The first one, which is the topic of my blog today, is on global health. So, you might expect there to be a lot of talk about malaria, influenza, MERS-CoV, Ebola virus, sleeping sickness, dengue fever, tuberculosis, HIV/AIDS, and other infectious diseases. And those are most certainly topics of intense interest to NIH and our colleagues around the world. But this particular meeting is about a different kind of global health threat that’s becoming a rapidly growing problem: chronic diseases. While infectious diseases remain a significant problem in the developing world, cancer, heart disease, obesity, diabetes, and other non-communicable diseases are now among the fastest growing causes of death and disability around the globe. In fact, nearly three-quarters of the 38 million people who died of chronic diseases in 2012 lived in low- or middle-income countries . To explore and support research strategies aimed at stemming this surge, NIH helped to form a new global health initiative in 2009 called the Global Alliance for Chronic Diseases (GACD). The group’s founding members included national research agencies from six nations: the United States, United Kingdom, Canada, Australia, China, and India. Since then, research agencies from South Africa, Brazil, and the European Union have also joined. It may seem counterintuitive that as a nation becomes more affluent, rising from low to lower-middle income, its burden of disease shifts from infectious and parasitic (communicable) diseases to chronic conditions, also referred to as non-communicable diseases (NCDs). However, this seems to happen rather predictably when urbanization occurs and per capita income rises, increasing purchasing power and enabling dietary and lifestyle choices that may raise the risk of NCDs. For example, increasing use of tobacco and alcohol, unhealthy food choices, and use of motorized vehicles and electronic devices that discourage physical activity, may increase the chances of developing high blood pressure (hypertension), obesity, elevated blood glucose, and abnormal blood lipids. In turn, these intermediate risk factors boost the odds of heart disease, stroke, cancer, diabetes, and respiratory diseases. Not only do NCDs take a tremendous toll on the health of individuals, their economic costs can inflict serious damage on a nation’s economy. Due to increased rates of NCDs, China and India alone are expected to lose $558 billion and $237 billion respectively between 2007 and 2017 . Such economic setbacks may contribute to a negative feedback loop that erodes public health services and slows future socioeconomic development. The good news is that many NCDs can be prevented by making lifestyle changes, such as reducing salt intake for hypertension, stopping smoking for cancer and heart disease, or venting cookstove fumes for lung disease. Other NCDs can be averted or controlled by taking medications, such as statins for high cholesterol or metformin for diabetes. For its first initiative, GACD decided to focus on research that would explore various approaches to preventing hypertension. Although elevated blood pressure causes no immediate symptoms, it’s important to control because it is a major contributor to heart attack, heart failure, stroke, and kidney disease. Hypertension projects funded by GACD members are currently underway in Argentina, Colombia and Peru in South America; China, India, and Malaysia in Asia; the Pacific Islands of Fiji and Samoa; and Ghana, Kenya, Nigeria, Rwanda, South Africa, and Tanzania in Africa. For example, in a population-wide study being conducted in the Tumbes region of Peru, NIH-funded researchers are testing to see whether replacing regular, high-sodium salt with a salt substitute (2/3 sodium chloride, 1/3 potassium chloride) is effective in lowering blood pressure. Another NIH-funded team in Ghana is comparing the effectiveness of the World Health Organization’s nurse-based approach to hypertension management to that of the doctor-based approach typically used in developed nations. Meanwhile, in India, Kenya, and Tanzania, researchers supported by other GACD members are using smart phone technology to diagnose and monitor patients with hypertension, and test whether interventions by local health care workers are effective. During the GACD meeting in Shanghai, leaders of all the participating countries will review progress, and look ahead to another upcoming research effort aimed at preventing another lifestyle disease: type 2 diabetes. Rising in dangerous lockstep with obesity, diabetes has reached pandemic proportions in many parts of the developing world. And that’s a very disturbing situation because the disease is a leading cause of blindness, kidney damage, and amputations, as well as a major risk factor for heart disease. About 347 million people worldwide currently have diabetes  and by 2030, the World Health Organization estimates that diabetes will be the seventh leading cause of death. Global attention to NCDs is indeed growing. On July 10-11, the UN General Assembly will review progress achieved in the prevention and control of NCDs since it issued its Political Declaration on Noncommunicable Diseases in 2011. Over the past three years, the WHO has established a list of nine health targets for 2025 to reduce NCDs, accompanied by a list of 25 indicators to monitor progress . Chronic diseases truly represent an enormous threat to the health and economic well-being of all the world’s peoples. But if the world’s biomedical research leaders continue to work together to build a solid base of scientific evidence to inform public health efforts, and if national leaders assume responsibility for implementation of effective preventive strategies, we should be able to curb the rise of these diseases, and maybe even reverse the trends. How about an organized yoga curriculum that includes nutrition, meditation, breathing? Thanks. Interesting and very important data. With this on the table, I would therefore hope that policy makers in developing countries(particularly in Africa) make proper use of such information to better shape the future of their countries by ensuring the health of their population. This was a very interesting article. I do not read blogs in general, but do like having the ability to educate myself when ever I can. I have noticed when you get older most of us think about health and even try to make changes in our diet and even bring exercise into our lives. Thank you so much Dr. Collins for sharing this article with us. Yes, you are absolutely right that now non-communicable diseases are the main causes of death. To avoid heart disease, stroke, cancer, diabetes we need to change our lifestyle and also our food habit. Of note to those interested in learning more about NCDs and Global Health, Fogarty and USAID have teamed up through FAES to offer a new course on NCDs and Global Health in the Fall semester. All are welcome to take the course which is currently open for registration through the FAES website.